During the gray days of January is a great time to focus your attention on the spaces in your home that are often used but rarely seen. Let’s talk about linen closets. 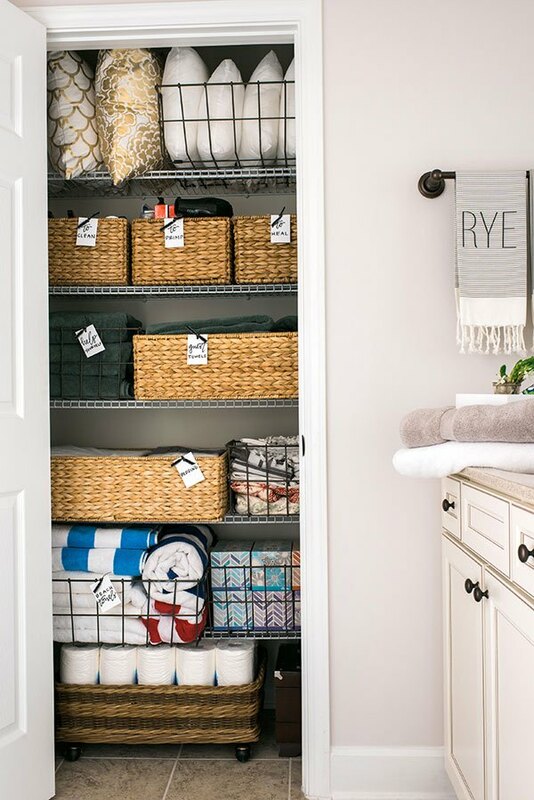 Whether you have a large closet or a small nook or set of shelves that function as your “linen closet”, these tips will help. How many should I have? Towels: 2 sets per person plus an extra (in case you have guests and need to do laundry at the same time). A set includes: bath towel, hand towel, and wash cloth. What else goes in the linen closet? Store sheets by size. Fold the flat sheet and fitted sheet as neatly as possible, then store them inside one of the pillow cases. Consider labeling the spot on the shelf where each specific size sheet set goes, to avoid confusion or having to un-fold the sheet set to find the size you’re looking for. You could use cloth storage boxes to keep sheets free of dust. Stack or roll towels. Sort by size and color, or by particular bathroom in which they are used. Use large baskets or bins to hold extra blankets & comforters or sleeping bags. This will keep them off of the floor & avoid dust. Image from Honey We’re Home. Image from Waiting on Martha. Display family recipes. The kitchen might be an unlikely yet perfect place for a gallery wall of framed recipes. If you don't have ample wall space, the kitchen counter can be a great place to display one or two favorite family recipes in frames. Eliminate unnecessary duplicate items. If you have more than one can openers, mixers, blenders, etc. they are probably taking up space in your kitchen without adding functionality. Depending on how often you cook and for how many people, think about the quantity of baking dishes, pyrex bowls, wooden spoons, and spatulas you really need. Chances are, you have a favorite few dishes that you use regularly. How much tupperware is too much tupperware? Depending on the size of your family, two of the sizes of tupperware containers you use most frequently are plenty to have on hand! To avoid collecting excessive plastic wear- put your last name on them so you know which ones are yours and which ones need to be returned to friends. It might be time to purge all of your old mismatched plastic food containers and start fresh with a new set! Also think about accessibility. Are the people who need access to specific items, able to reach them where they are stored? The higher shelves are perfect for fragile glass wear, seasonal or occasionally used serving pieces. Of course, knives should be kept far away from the edge of the counter. For your drawers: dividers. These little storage tools come in variations of material and sizes. Whether you want wooden, plastic, or wire dividers they keep your kitchen tools and utensils in easy to grab sections. Choose ones that a) fit in your drawers and b) fit the decor of your kitchen. Let's talk pantry. To create order, print simple labels for your shelves and bins. Leveled steps are great for cans and jars. Each week before you grocery shop, assess what food is old and toss it. Place items that are close to the expiration date at the front of the shelf. Practice keeping these perishables in one area to avoid them getting shoved to the back and forgotten. For refrigerator organization - check out this link. You can do it! Pour yourself a mug of coffee or a glass of champagne and turn on your favorite tunes. Happy kitchen organizing! Also, check out our Father's Day Gift guide post from last year. February is a great time to go through your closet. Purging your closet prior to switching out seasonal clothes makes it easier to see what you have and see what you need next winter when you transition again. We have come up with a few suggestions on how to get started and questions to ask yourself when you get stuck. One of the most helpful things is to closet purge with someone who you can trust to tell you the truth about what's flattering and what's not, what looks dingy, and what is outdated. We always suggest pulling everything out and categorizing by type of item. For example, shoes, belts, t shirts, nicer shirts, skirts, sweaters, jackets etc. Pick a category and go through each item and decide whether to keep it, give it away, return it to someone, or trash it. Once you are done with the category, put the items you are keeping back into the closet. Often times when organizing you will end up with a "maybe" pile or those items that are just really hard to make decisions on. The following questions may help you figure out why you are hesitant to let it go which may help you make a decision. 1. Do you feel good about yourself when you wear it? 2. Have you worn it in the past year? 3. Do you have other clothing items that look very similar or serve the same purpose?